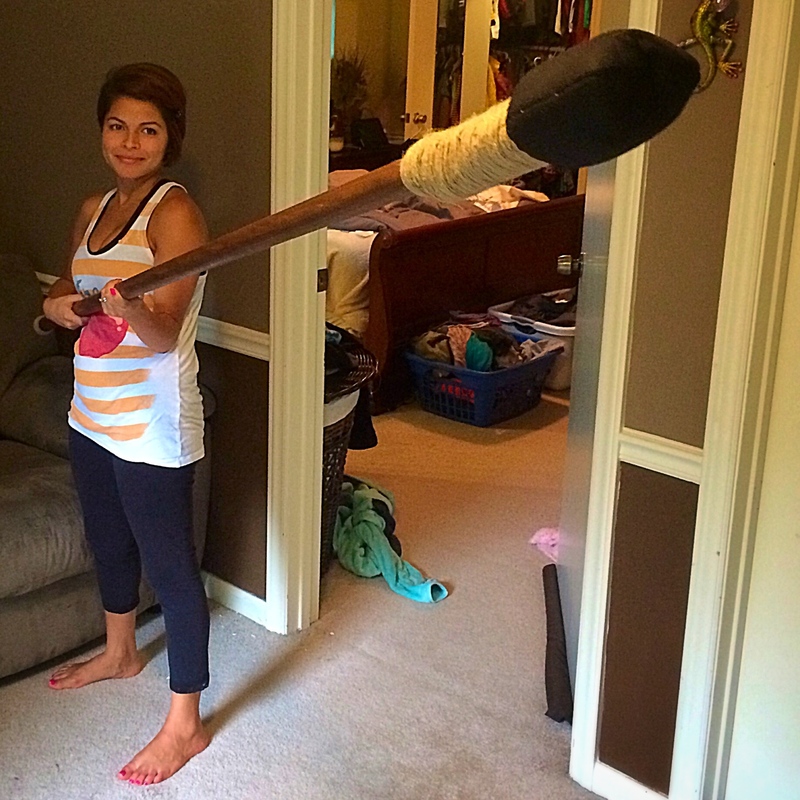 Introducing the newest weapon to my armory, the English Quarterstaff. I don’t know how this fine weapon eluded me for so many years, but thanks to a fencing student of mine, I’ve found a new training tool. Pictured here, in the lovely arms of my wife Jenny, is the might beast itself… a weapon constructed for no more than $12 USD. A quarterstaff (plural quarterstaves), also short staff or simply staff is a traditional European pole weapon and a technique of stick fighting, especially as in use in England during the Early Modern period. The term is generally accepted to refer to a shaft of hardwood from 6 to 9 feet (1.8 to 2.7 m) long, sometimes with a metal tip, ferrule, or spike at one or both ends. The term “short staff” compares this to the “long staff” based on the pike with a length in excess of 11 to 12 feet (3.4 to 3.7 m). It started with a trip to Lowes Home Improvement, where I picked up an 8′ dowel rod 1 and 1/4th inches thick (made of poplar). The price of this was only $7.50. My next trip was over the the Dollar General, whereby I purchased one double-pack of household sponges and one black oven mitt. As you might be able to work out yourself, this turn out to be $2.12. My final stop was Michael’s, just next door in the ol’ shopping center. Michael’s is a craft store and one in which I was only after one particular item – twine rope ($2.43). When you get home and lay out all your supplies, the simplicity of the task is likely to smack you right in the face. A few optional items that I used (that you may want to use yourself) were duct tape, a rubber chair end (1 & 1/4inch) and a walnut-color wood stain [again, going for more of an “antique-y” look]. 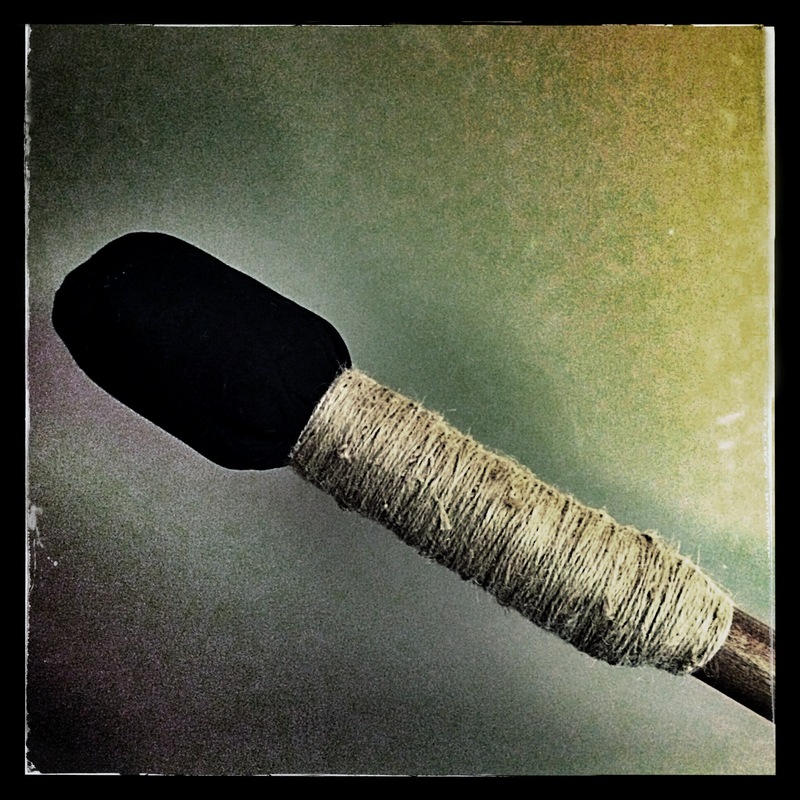 After staining the wood and allowing it to dry, I taped the sponges to the end of the staff. This gave it a soft, round, end, with quite a bit of cushion to it. Then I positioned the black, oven mitt to the end (pushing the thumb inside-out) and tightly taping the lower half of the mitt to the staff. Since the tape is rather “modern” and unattractive to look at, I meticulously wrapped the twine rope around the lower portion of the mitt. This was a time-consuming process (approx. 45min – 1 hour) and obviously could be omitted if one wished. Lastly, I applied a rubber chair end/stopper to the end of the staff. I figured that if the staff was ever to be dropped or handled roughly, this would minimize splitting and damaging of the staff’s aesthetic. Needless-to-say, this quick and inexpensive project produced a superb training tool. After only one hour of practice, my arms were killing me. I’d be surprised to find a martial art weapon that works the arms and core like pole weapon training. Good luck in the construction of your own! Please let me know if you have any questions or comments below. Streetfighting 101 DVD has arrived! T.J. Kennedy, founder of the Hybrid Fighting Method does it again with the emergence of his second dvd. One of the most important aspects regarding the physical side of self-protection is in controlling your opponent using the proper mechanics. T.J. leads you step-by-step and goes through much more in this amazing dvd. For a view at the kind of material that T.J. presents, please visit his YouTube Channel. If you have any questions, T.J. will be happy to answer the question in the comment section below. T.J. Kennedy of the Hybrid Fighting Method™ gives his review of the Isurus™ Keychain [get one here]. It’s only been a year, but positive reviews & testimonials have been pouring in for this keychain. The fact of the matter is this – Yes! You’ve seen it before (kubotans) – but not quite like this! Watch the video above to hear what Mr. Kennedy has to say about these highly-effective and confidence-inspiring tools. The CombativeCorner is never going to become the website directed at pushing products. We will never sell-out, give ad-space or accept payment for issuing any sort of review or endorsement. However, we have a lot of talented people here in our CC family and we want to keep our readers informed with some (if not, ALL) of their great work (for example, HFM Dvd, Sifu Lee’s books, etc.). Please do not forget that you can download a free, basic manual here at The CombativeCorner (or by the following link : here :). The Isurus™ was created to help people not only feel safe, but stay safe and afford them better leverage when encountering a violent attack. Practical, lightweight and affordable, the Isurus™ (in my opinion) is a no-brainer (especially for those in college). Please use the comment field below if you have any questions for us! Thank you & Stay Safe! *The Isurus Self-Defense Keychain is to be used for Self-Protection Purposes Only.